You know when you’re looking for your keys and you can’t find them anywhere? You’re in a hurry. You have things to do and places to see. But your keys are nowhere to be seen. You look everywhere. Under the sofa, in your pockets, and you walk around the house countless times. And nothing. They don’t seem to exist. Then you look in your hand, and there they are. They were always right there, in your hand. If you would’ve been aware of the here and now, you would’ve found them without having to go through all the hassle. Finding your purpose in life is the same way. It’s always been inside of you waiting to be discovered. It doesn’t need to be found. You just have to be open to it. The problem is that we’re so busy looking for our purpose that we can’t see that it’s right here. We’re looking for peace in all the wrong places, when it’s always been inside of us. I notice this tendency in myself, and I see how I’ve fallen into this trap many times in the past. There are thousands upon thousands of articles out there on how to find your life purpose, and many of them operate on a not so helpful assumption. And that assumption is that your life purpose is something you have to find. It’s much simpler than that. In fact, it’s so simple that most people dismiss it. So what’s the secret to finding your life purpose? The secret is to become still enough to hear the whisper of wisdom inside you. Notice what you feel compelled to do. Where do you feel drawn? What are you excited about? 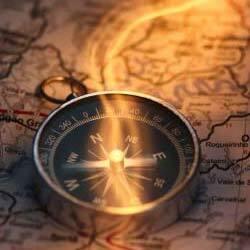 You see, we all have an internal compass that is ready to guide us. But first, we have to be willing to become still and listen. This isn’t always easy with all the thinking we do, because our internal compass operates on subtlety. It whispers, while the mind screams. It nudges with inspiration, while the mind uses scare-tactics. Deep down, you know what needs to be done, but thoughts of fear pop up. If you can anchor yourself in the present moment, you will realize that everything you need is already here. Dip your toes into the present moment as often as possible. It can be as simple as being aware of your breath a few times each hour. Become curious about what it feels like to breathe when you’re extremely aware of what’s going on inside your body. After a while, the awareness will expand further, but start small. Start now. There will be no salvation in the future, because when the future comes, it comes as the present moment. When I become quiet, breathe and notice what I feel compelled to do, it’s almost as if life lives itself. For example, I felt the inspiration to write this article. I still had to plan, outline and write it, but it came out of a state of stillness. What If You’re Not Excited? In some people the impulses, inspiration and excitement have been suppressed for so long that they are barely noticeable. You just have to start with what you have. This is not something where inspiration will suddenly slap you in the face. The way life unfolds is much more subtle. The inner voice and the nudges I get are more like whispers and feelings that develop over time. And that’s why it’s so important to quiet your mind, because you can’t hear the whispers if your mind is in the way. So if you’re not excited, that’s fine. You may still notice that you are interested in something. If so, start there. And if you’re not interested in anything, pretend that you are and see what happens. All you have to do to find your life purpose is to anchor yourself in the present moment. Your purpose is right here, right now. You don’t have to try and figure life out, you just have to stay in this very moment. So notice your breathing, your body, and what’s going on around you. Then listen to what you feel compelled to do. In what direction do you feel drawn? Sometimes you don’t feel drawn anywhere, and that may be because you need to rest. Don’t make this into something you need to perfect. Play with it and see what happens. Always remember, you can get in touch with your purpose by listening to your intuition. It has always been there, and it will always be there. The more people do this in business, the more impact it will have on the world. But the change starts within you. P.S. Are you interested in learning more about how to to truly do what you love? 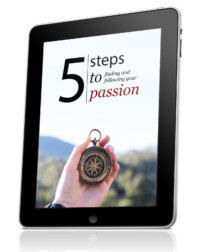 Then I invite you to check out my course, Live Your Passion, in which I share everything I’ve learned from doing this since 2004, and teaching others since 2009. …shape clay into a vessel – it is the space within that makes it useful. I feel such a compulsion to open your mails Henri, ergo, profit comes from what is there, usefulness from what is not there. HJ does it again! We are on the same page here mate, if you surrender to the present you are your purpose and everything then reveals itself. Absolutely. Not always easy, but remember, one step at a time does it. Be still and quiet your mind. Right there in your inmost, you can find the answers to your questions. The wisdom you need to find your purpose is inside you. I feel nourished reading this Henri. Thanks. Glad to hear that. Thanks for the comment! The older I get, the more I keep coming back to the simple and beautiful truth you’ve written about here, Henri. Clearing the space and making room and quiet to hear the still small voice is the ongoing challenge, but your advice to start with tiny steps is so important. We can’t start anywhere except from where we are. Agreed. It’s easy to feel like something is wrong, or that you’re not doing it right, but that’s just another thought. Welcome it, let it be, and bring yourself back to the here and now. So true. My current direction is so peaceful, and yet so in balance with my core beliefs. And yet, there are still days when I need that quiet that is nothing more than rest. Yup, I’ve found the same thing. Even though I’m doing work I love, I still need to recharge my batteries. I have a tendency to want to do too much, so it’s something I’m constantly getting better at. Henri, great post! I am so happy to have found your website. Very practical compared to most of the other stuff out on the web. I have a question for you and I understand if it’s too much. For the last year and a half I have been struggling with the many ‘passions’ that I have and it’s boiled down to helping people to be content with their lives and look forward to the future. I am strongly considering going back to school to become a certified psychologist, however there are some who have found a way to help people without going through all of the institutions. How did you make your decisions and have you ever considered the possibility that you could have more of an impact if you were certified in counseling/psychology/etc.? I’ve considered going down that path, but it has never grabbed me. I’ve tested working with people in a coaching/counseling capacity but it just didn’t feel right, so I kept on going. That may or may not change in the future. The important part is to try different things so you know if it’s something that resonates with you. There are definitely ways to have an impact without being certified, so it’s completely up to you. Erik, I was helped enormously by bioenergetics therapy and verbal therapy years ago.Also the option method is a type of verbal therapy that doesn’t require college degrees and is excellent.My home environment was very dysfunctional as a kid,unfortunately.Henri’s work really resonates with me also. I love that sentence. Some great insights and thoughts that I needed to hear right now. I’ve been searching for my purpose and my mind has been screaming, but the reality of it all is, my screaming mind isn’t helping. Just being still is. It really is inside of us, all we have to do is allow it be seen. Yes! It’s not always easy, because our mind constantly tries to get back in, but once it realizes that this is an easier way to live, it’ll start to cooperate more. Being an introvert, quieting my mind should come easy, but sometimes it can be difficult. I find myself so caught up in needing to earn that I neglect what I really want to do. I know the value of solitude, yet I don’t practice it as much as I should. I’ve found that although introverts don’t speak a lot on the outside, they do have a very active internal dialogue. At least I do. But the more intense my internal dialogue is, the more it has propelled me to stay present. It’s funny how you are driving home what I already know…and yet I find it so hard to actually do. I’m working on it….and I will keep working on it. Great article Henri! I’ve recently started taking one day a week completely off of work and everyday errands. I try to rest and listen to my “inner voice” on these days. It’s hard to hear the little whisper of your heart speaking in a world that’s always engaged and active, and completely immersed in the mind. Thanks, Henri. As usual, your ideas get to the core of what matters. Thank you, Cornelia, for the great quote, and thoughts! All true, and I’ve found it helps to.focus my conscious thinking mnds awareness on my heart center and as I inhale through my nose I imagine I’m drawing the past up from below and the future down from above to find the present in my heart. Then as I hold my breathe I surrender to the present moment. Finally, as I exhale through my mouth I feel myself living from my heart in the present moment guided by the wisdom of my heart. It brings a smile to my face and returns me to the present moment and the peace within. very nice article. I was impressed a lot and I think the most influential sentence in my case was “There will be no salvation in the future, because when the future comes, it comes as the present moment.” I’ve always had the habit of waiting for a better tomorrow but it won’t continue anymore. Anyway your article was very helpful and had an outstanding effect on me. Thanks for a great post. That is so true. Sometimes, you don’t even have to search for the purpose. You discover it along the way. The key is to not pressure yourself so much. And just look at the things that makes you happy. Then, use those as cues to find the only thing that you can do without being unhappy.